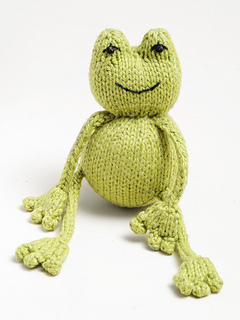 Ribbit is knit up in the fabulous Spud & Chloë Sweater in the Grass #7502 colorway and you only need one skein. The added twist is that inside of the body is a tennis ball! This means that Ribbit bounces when tossed! How fun is that? The bounce is softened because of the knitted enclosure but this makes it even better for indoor play.